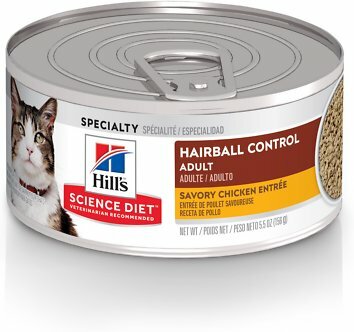 Hill's Science Diet Adult Hairball Control Savory Chicken Entree lets you indulge your cat with the taste of savory minced chicken while controlling hairballs. It includes natural vegetable fiber to help control and avoid the formation of hairballs by moving hair through your cat's system. This formula also provides complete and balanced daily nutrition for adult cats, with essential nutrients to nourish your cat's skin and coat. The delectable taste of high quality lean protein promotes lean muscle. Includes key nutrients to help prevent hairballs and maintain healthy organs. 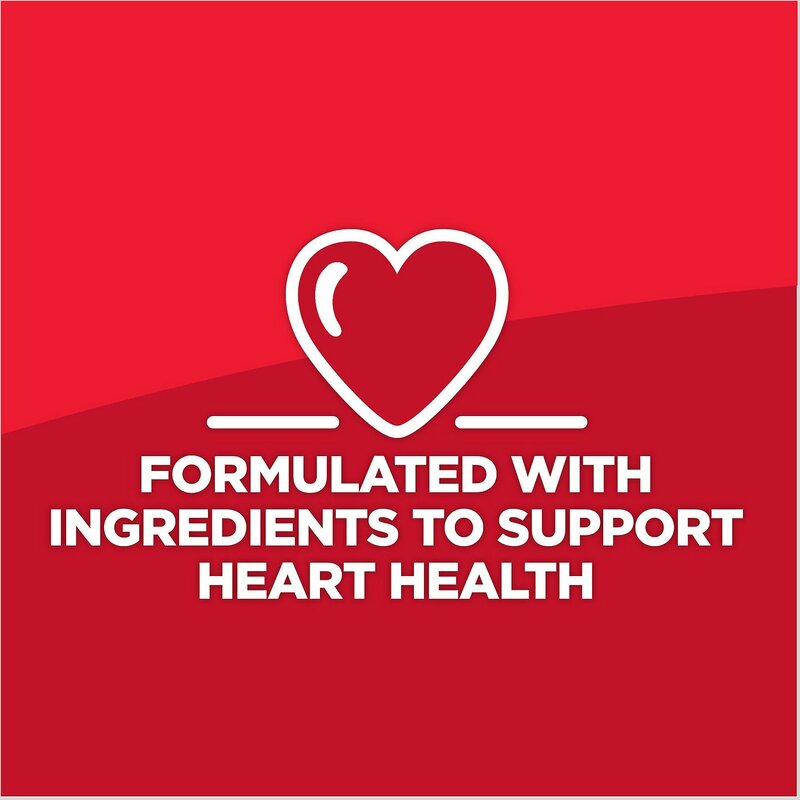 Contains components such as taurine to help maintain vision and heart function. 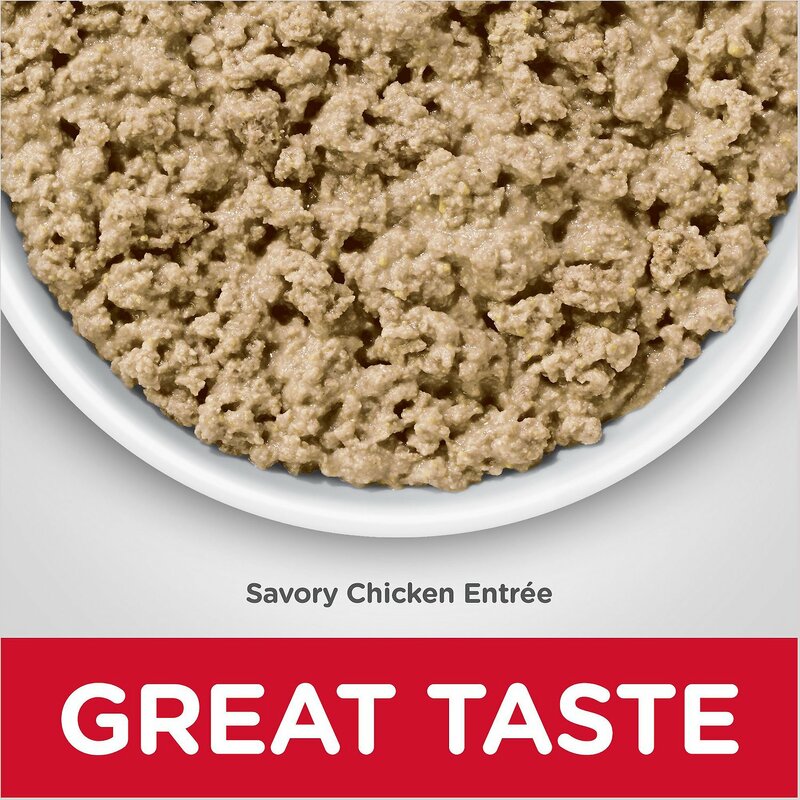 Free of artificial flavors and preservatives for the perfect balance of taste and nutrition. 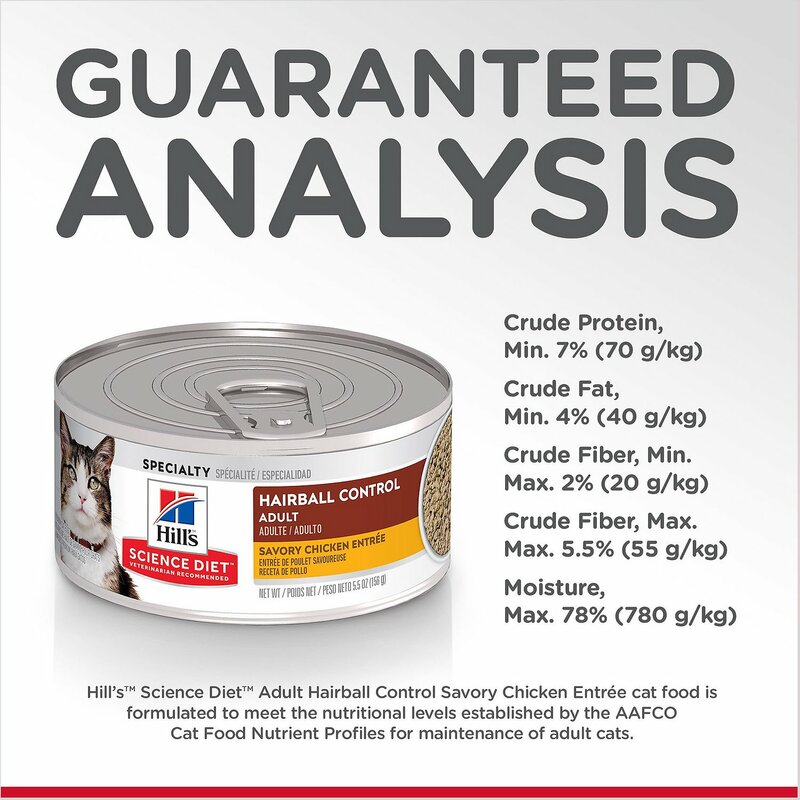 A complete and balanced diet recommended for adult cats 1-6 years of age. 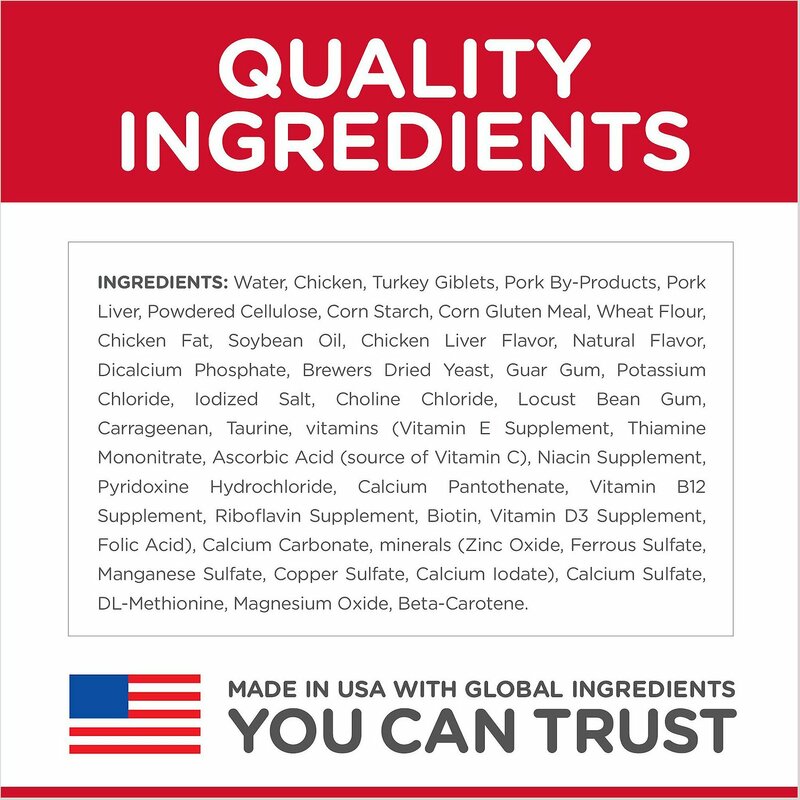 Water, Chicken, Turkey Giblets, Pork By-Products, Pork Liver, Powdered Cellulose, Corn Starch, Corn Gluten Meal, Wheat Flour, Chicken Fat, Soybean Oil, Chicken Liver Flavor, Natural Flavor, Dicalcium Phosphate, Potassium Chloride, Titanium Dioxide color, Guar Gum, Brewers Dried Yeast, Iodized Salt, Choline Chloride, Locust Bean Gum, Carrageenan, Taurine, vitamins (Vitamin E Supplement, Thiamine Mononitrate, Ascorbic Acid (source of Vitamin C), Niacin Supplement, Pyridoxine Hydrochloride, Calcium Pantothenate, Vitamin B12 Supplement, Riboflavin Supplement, Biotin, Vitamin D3 Supplement, Folic Acid), Calcium Carbonate, minerals (Zinc Oxide, Ferrous Sulfate, Manganese Sulfate, Copper Sulfate, Calcium Iodate), Calcium Sulfate, DL-Methionine, Magnesium Oxide, Beta-Carotene. Cover and refrigerate unused portion. Adjust feeding amounts as necessary to maintain optimal weight. If you are unsure, ask your veterinarian. New to this food? Mix increasing amounts of your pet's new food with decreasing amounts of the old food over a 7 - day period. Keep fresh water available at all times! Your pet's nutritional needs may change as they age. Ask your vet at every checkup. Science Diet is available in a wide variety of dry and canned foods for your pet’s unique needs. We recommend transitioning to a new food over 7 - 10 days to avoid digestive upset. Gradually increase the new food while decreasing the amount of the old food until only the new food is fed. 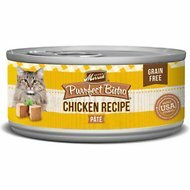 My cats love it, as it is a treat twice a week from dry food. However, I have to go in the bathroom and close the door to open ANY type of can. If they hear the click of a tab, or the can opener, they are under my feet instantly! This Hairball Control food really works. My intial experience with Chewy was excellent. I will be reordering soon. 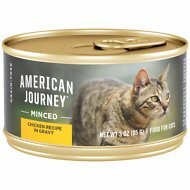 The product I order is preferred by my cat and she eats it daily. I started my 8 year old kitty on this as she throws up hairballs nearly every other day or so. She's been eating this now (happily eating it) for about 2 weeks and only once has she thrown up a hairball. I call that great! The food is a "pate" and is very wet which means it's hard to remove it from the can. Other than that, we like this food so far. I have been buying Hills Science Diet for years. 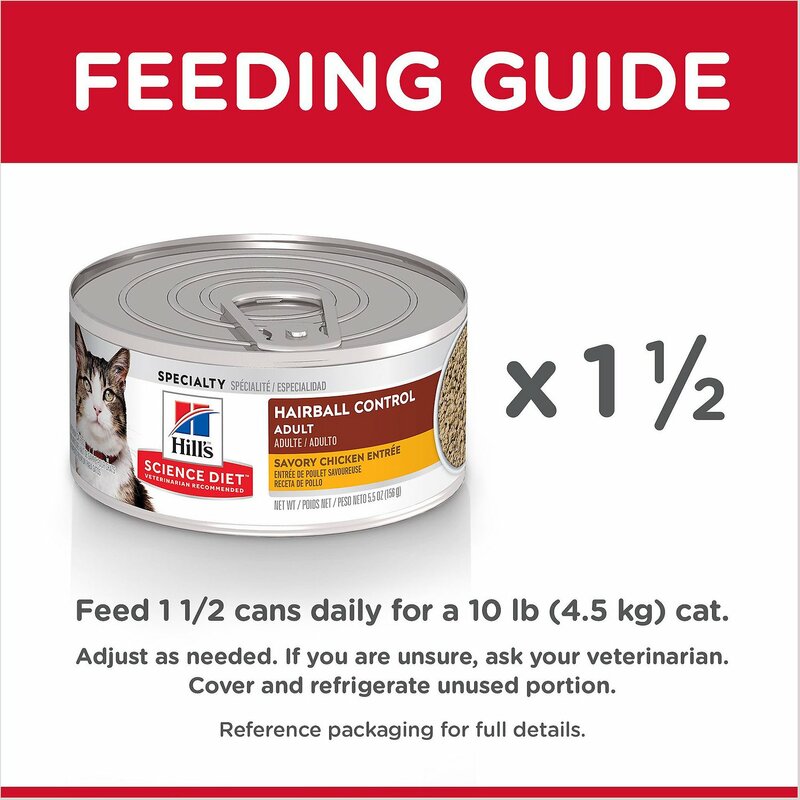 I have been feeding my cats Hills Science Diet for years.I have 3 cats now, Koli, Angel(she is anything but)and Callie.Before these 3 I had 6 cats and all of them lovwd Hills Science Diet. This is the first tine for The hairall control chicken. And they love it. Have been buying this for a year and the hairballs have decreased tremendously. Fast shipping, excellent product ...great price! What more do you need? Hey the photos speak for themselves. :) Happy kitty. My 2 long hair cats left me presents every other day on my floor before I tried Science Diet hairball formula. It has been 5 weeks and I am amazed! Only one fur ball between the two!